"Food for Thought Leads to Less Waste"
Students sorting waste for the Trash Audit. While Baby Boomers became the 'trash generation,' we hope that the Millennials will become the 'zero waste generation,' if they can be influenced early enough. Starting in 2002, a local non-profit, Food for Thought Ojai, approached the school district about serving healthier lunches and raising awareness about food, nutrition, and local agriculture in the Ojai Valley. Through looking at food, explorations expanded to include an examination of the waste that the schools were generating, including food waste. The school set a goal to reduce the overall amount of trash going from the school to the landfill. All of these explorations culminated in expanding the efforts district-wide to address comprehensively "green schools" issues. The focus started with developing a school-to-farm curricula, with field trips to local farms, school gardens in the elementary schools, a nutrition curriculum, and a special fresh fruit and veggies salad bar. The Wastestream Project started with students and teachers auditing trash generated at schools and offices throughout the district, identifying problems, and proposing solutions. The school-based Green Teams educated classmates, teachers and parents about how to reduce waste through special assemblies, lunch waste monitors, compost bins at several schools, and more recycling and compost bins with better signs. After the first year of the Wastestream Project, the district adopted the 5R's approach: Reduce, Reuse, Recycle, Rot and RETHINK! The number of recycling dumpsters were increased and the frequency of recycling pick-ups were increased, since previously the recycling bins would fill up and the extra recycling would end up in the garbage. The work to improve Food Services and serve healthy, fresh, locally-grown food continues. More analysis is underway to determine how to incorporate more fresh food choices and menu's that students will enjoy that will fit within budget constraints and also reduce the amount of food wasted. The Wastestream Project has succeeded in increasing recycling rates, reducing trash going to the landfill, and saving the district money via reduced hauling fees. Each school in the district now has the same recycling bins and signs, so there is a consistent approach. The School Board in 2008 adopted a Green and Healthy Schools Resolution that established a district-wide Green Schools Committee. Work is underway to implement the goals established in the resolution, including environmentally preferable purchasing, switching to green cleaners, and energy conservation. Food for Thought-Ojai has been a strong community partner throughout all these green and healthy school projects. FFT has helped raise outside funds to support the district's efforts. Students, parents, teachers, administrators, and staff have all been involved in a variety of ways. The Superintendent has provided leadership at the top, which is critical. And the School Board has been very supportive. The newly established Green Schools Committee is comprised of all the key components of staff, parents, and teachers throughout the school community. Green Schools Initiative has provided advice and expertise in the Wastestream Project and on the broader Green Schools efforts. In the elementary school grades, the curricula now integrates the healthy food and waste reduction activities. Students at OUSD are now starting to test new systems for separating their trash and recyclables; expanding the worm composting of some food scraps; reusing scrap papers; packing waste-free lunches; monitoring the sorting at lunchtime; and doing a better job of finishing their milk and lunches. 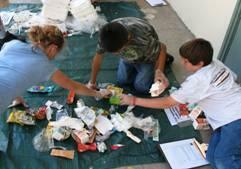 At Matilija Middle School, the student Leadership Group is in charge of the waste reduction efforts. They have made recycling bins for all the classrooms, help take out recycling, gave a school-wide assembly and made educational videos, and are looking into ways of "greening" the school fundraisers. The High School has integrated waste reduction into some of the science classes, the senior honors projects, and some of the student clubs and organizations. We also engaged an outside evaluator to assess the impacts of the projects on student knowledge and awareness. Student surveys done before exposure to the curricula and after show that student awareness of environmental concepts, waste reduction, and actions they can take have all increased significantly. This outside evaluation has helped to increase the credibility of the efforts among teachers, the school board, and parents. The healthy food projects started back in 2002. The Wastestream Project started in 2007. The School Board Green and Healthy Schools Resolution was passed in 2008. The kids and our common future. While baby boomers became the “trash generation,” there are hopes that the Millennials will become the “zero waste generation,” if they can be influenced early enough. Schools are creating opportunities for kids to develop their own innovative and inspiring ideas for making the "Five R's" a reality beyond the schoolyard. Ojai students are considering advocating for citywide bans on plastic bags and development of commercial-scale composting facilities for the whole county. The district is also starting to think about its carbon footprint.